From beautiful natural chamber reverb to surging delay cascades, the rich sounds of the legendary Abbey Road Studio Two echo chamber are now at your fingertips, complete with Abbey Road’s long-lost S.T.E.E.D. setup. 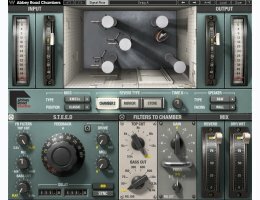 The Abbey Road Chambers plugin recreates a defining part of the studios’ legendary sonic signature – the echo chamber used by Abbey Road’s pop engineers to create exciting reverbs, delays and other unique spatial effects on countless classic recordings by the Beatles and beyond. Developed together with Abbey Road Studios, Waves’ Abbey Road Chambers puts you at the controls of the Studio Two echo chamber, complete with the original valve Neumann KM53 microphones and Altec 605 speaker, as used on almost every pop recording done at Abbey Road during the 60’s. Abbey Road Chambers also gives you an additional set of the original filters going into the chamber – EMI’s RS106 hi/low pass filter and the EMI RS127 Presence EQ – to further sculpt the perfect chamber sound. Also featured is a complete recreation of Abbey Road Studios’ original S.T.E.E.D. (Send. Tape. Echo. Echo. Delay.) setup – a system designed to extend the chamber’s natural sonic palette into new territories, by splitting the signal and creating a feedback loop from the studio’s REDD console, through a dedicated tape delay, via RS106 and RS127 filters, and then to the chamber and back. As a bonus, the plugin also includes two additional legendary spaces: Abbey Road’s famed Mirror Room, and the Stone Room from Olympic Studios, London. Abbey Road Chambers is designed in a modular fashion: You can send your tracks just to the chamber, or you can isolate just the S.T.E.E.D. effect, or you can combine both for the full range of sonic possibilities opened by the original Abbey Road setup. From natural chamber reverb, to authentic tape delay, to complex hybrid effects – the door to the one-of-a-kind vintage acoustics of the Abbey Road chambers is finally open. USB displays are not supported as the primary display.